Quite a few people have said, “plagiarism is the highest form of flattery.” However, when someone takes a large chuck of original words written on a website and then publishes those same words as though it were their own on another website, without permission or attribution, this crime of plagiarism is viewed in the legal community as theft of Intellectual Property. For example, an owner of a website from India decided to copy our Internet marketing services home page text. So, we decided to do a couple of things about it. First, we issued a Cease And Desist order to the perpetrator and the hosting company. and any other copied material from [India] website or associated websites.. It is important to grow your business and expand your brand recognition using all the strategic tools available. Obtaining quality sales leads, new customers, expanding market reach, communicating with existing customers, and increasing your company’s sales is the goal. 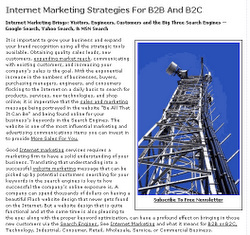 With the exponential increase in the numbers of businesses, buyers, purchasing managers, engineers, and consumers flocking to the Internet on a daily basis to search for products, services, new technologies, and shop online; it is imperative that the sales and marketing message being portrayed in the website “Be All That It Can Be” and being found online for your business’s keywords in the Search Engines. The website is one of the most influential marketing and advertising communications items you can invest in to provide More Sales For You. Good Internet marketing services requires a marketing firm to have a solid understanding of your business. Translating that understanding into a successful website marketing message that can be picked up by potential customers searching for your keywords in the search engines is key to how successful the company’s online exposure is. A company can spend thousands of dollars on having a beautiful Flash website design that never gets found on the Internet. But a website design that is quite functional and at the same time is also pleasing to the eye; along with the proper keyword optimization, can have a profound effect on bringing in those new customers via the Search Engines. See Internet Marketing and what it means for B2B or B2C, Technology, Industrial, Consumer, Retail, Wholesale, Service, or Commercial Business. Notice is hereby given to cease and desist. Next process involved Google with a report of Digital Millennium Copyright Act, DMCA, infringement. We documented all of the information required and then faxed it to Google. Here is a quote from part of the letter. It has come to my attention that there is a copyright infringement of the copyrighted work that is displayed on our web page at www.pwebs.net home page. See below. We heard back in a relatively short amount of time from the hosting company. We have contacted them and gave them 24 hours to comply or face the web page being disabled or the site suspended. If this material remains after 24 hours have passed, then please let us know. Thank you. Thank You for bringing this to our notice, Content have been removed. In the interest of not providing a search engine link in this posting to the perpetrator; names and website links have been omitted. If you wish to see the image of the site that was guilty of plagiarism, then click on the link above. Then do a search for the name. The name they are using is in itself a well known financial services and insurance company. This site is playing with fire. If you have a business with an online presence then it certainly is important to check the Internet on a regular basis for copyright infringements. An excellent resource can be found at www.copyscape.com. Free use of their online program can tell if there are any websites that have copied your intellectual property content. Just enter the URL into the search bar. Go here for more information on copyright violation issues. Contact Professional Web Services, Inc. for ethical marketing and advertising, ethical search engine optimization, and ethical Internet marketing services.